Are you the friend everyone turns to when they are looking to update their professional or personal spaces? Have you ever walked into a barren room and seen endless possibilities? If this sounds like you, a career in interior design could be a perfect fit. Whether consulting with organizations on how to create a space that maximizes employee productivity or designing a nursery for first-time parents, the options for interior designers are wide-ranging. There are also many online degree programs available in this field to help students pursue their goals. This guide provides the inside scoop on online degrees, certifications required, specializations offered, and careers to help aspiring interior designers make informed decisions about their future. Studying to become an interior designer may be of interest for those looking to hone their creative and technical abilities. Enrolling in quality online interior design degree programs can help students meet their academic and professional goals while fulfilling other time commitments. 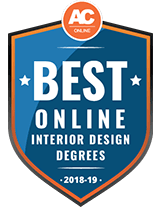 We have found the top online interior design degree programs in the country based on factors such as cost of tuition, course size, and availability of student services. Discover the top online interior design degrees for 2018-2019 here. Century College offers a hybrid associate degree program in interior design that can be completed in 2 years through a mix of online, daytime and evening courses. The Associate of Applied Science in Interior Design prepares students to market their services and sell their products after graduation. Century College also has a American Society of Interior Designers (ASID) student chapter that graduates can join for professional networking purposes. Financial aid resources are available for online students. American River College offers a hybrid associate degree program in interior design. The program receives input from an advisory committee of professionals from the interior design community to ensure the curriculum is useful and provides a solid introduction to the industry. Earning a degree in interior design through ARC can be accomplished through some online coursework and classes taken in the evening and on weekends. Students in this program can apply for financial aid to help pay for their degree. Advances in digital technology and design have led to many schools now offering online degrees in interior design at multiple degree levels. Within these programs, potential students can select from many concentration areas. After perusing our guide, students can use the search tool below to find a school that not only offers a great degree program, but also meets their needs for great value, internship opportunities, program flexibility, and excellent support services. The field of interior design is flourishing, with the Bureau of Labor Statistics predicting a 19 percent growth through 2020. In 2012, the industry was responsible for over $10 billion in contributions to the national economy. While the average salary for an interior designer is $48,000 annually, those in the top 10 percent of the field bring home just over $87,000. Many creative types are drawn to interior design as it provides so many different areas of specialization. Whether your passion lie in sustainability, industrial design, lighting, the built environment, kitchen and bath design, or another area, a career in interior design provides lots of room for growth and exploration of the field. Online degrees in interior design are available at every level, including associate, bachelor’s, master’s and doctorate; many professional certifications are also offered. Within each of these, students can choose to specialize in a variety of topics, which will be covered within this guide. For those considering this path, it is important to be aware of the different positions available based on one’s level of education. For instance, those with associate degrees will be prepared for entry-level roles, such as design assistants, while those with bachelor’s degrees may be more qualified for designer positions. Associate of Applied Science in Interior Design: For graduates looking to move directly into the workforce. Students will be able to work as a designer’s assistant with this degree. Associate of Art: For graduates interested in pursuing further design education within the areas of interior space design. Associate of Science: For graduates seeking further design education with a focus on architectural and built-environment skills. Topics like color theory, drawing interiors, textiles, architectural lighting design, history of furniture and marketing and sales in interior design are all key components of most curriculums. Students undertaking full-time study can complete this degree, which is typically around 65-70 credit hours, within two years. Generally, there are no required prerequisites at this level outside of a high school diploma or GED. After completing an associate degree, graduates will be able to work as assistants to other designers; to be qualified for applying to entry-level positions, students should consider progressing to a bachelor’s level degree. A bachelor-level degree in interior design will equip graduates to pursue entry-level positions in a variety of settings, including architectural firms, decorative design organizations, and even freelance work. Developing skills in using technology to produce student’s visions is given special attention, with focus on drafting and design, 3D imaging and space planning covered in-depth in most programs. The creative and business components needed to thrive in this industry are also studied, allowing graduates to both design and execute spaces to enhance the personal and professional lives of their clients. Many of the online bachelor’s degrees in interior design also offer concentrations in specific design areas. Two examples are historic preservation or sustainable design. In some cases, internships are also encouraged and usually take place within an established interior design or architectural firm. Most online programs will work with their students to find a suitable site near them. In addition to general education requirements, students will cover a variety of topics including the history of design, space utilization, residential and commercial design, color theory, and drawing. Some schools may also require courses in art history. Students pursuing a degree full-time can complete course requirements within 4-5 years. Part-time study is available and completion timeframes will depend on how many hours students devote to studies per semester. For most programs, no prerequisites or prior design experiences are necessary, but demonstrable skills in art will be an advantage. Master of Arts, for students looking to design spaces and understand theories surrounding color, furniture, fixtures, and finishes. Master of Fine Arts, for students looking to work in an academic setting. Master of Science, for students interested in the built environment and architectural composition. Interior Design is a common industry for professionals to move into mid-career, meaning lots of master’s level programs offer ‘transition’ courses in place of pre-requisites to help students complete the degree requirements in a shorter amount of time. Some of the core curriculums students can expect to undertake include design theory, digital media and design, environmental psychology, professional design practice and research methods. For students with an undergraduate degree, most programs are between 33-36 hours and can be completed in 2-3 years depending on if the student is full or part-time. If the student has no previous education in interior design, the programs tend to be between 72-78 hours. Students with an undergraduate degree in a related field are typically required to submit a portfolio of work; those transitioning from an unrelated background may need to take some art foundations courses as part of the degree, depending on the program. The culmination of an online master’s in interior design is typically one of two options. Candidates selecting the thesis route will produce a significant piece of independent research on a topic closely related to the student’s area of specialization. Students opting to complete a creative project will need to develop a proposal highlighting both a creative use of their specialization and a solid underpinning of research. Examples of creative projects could include producing a design for a building or interior space, a business plan for a design organization or a design plan based on a specific theory, such as sustainable architecture. Master of Science in Architecture: Specialization in Interior Design M.S. Interior designers pursuing doctorate level education typically have one of three goals in mind: taking on a senior leadership position in a design firm, overseeing high-level government or consultation practices, or moving into a university level academic role. With these goals in mind, online doctorates in interior design provide a deep yet expansive base of knowledge and are heavily driven by research-intensive projects. Graduates will have highly developed and specialized skills that serve them well in any advanced positions they seek after graduation. The core curriculum for an online doctorate in interior design provides an expansive sampling of the interior design field. Some courses students will undertake include history of the designed environment, design planning and analysis, accessibility and environment, organizational systems, design education and quality of life and design, to name a few. Most programs will require a master’s degree in interior design or a related topic along with a portfolio of past design projects. In addition to this required certification, interior design professionals can also choose to undertake further professional certificates to add a concentration to their skill set or continue in their professional development. Most of these programs range from a few months to two years and many options are offered in an online format. Certified Interior Decorators International (CID) offers an online interior decorating certification that can be completed in 2-6 weeks and covers a variety of interior design elements, decoration theory, business practices and latest developments within the field of interior design. Many schools offer online certificates in interior design that can be completed in less than two years. Popular topics include drafting and design, color theory, business management, spatial planning, trends and materials. While this program will not make students eligible to take the NCIDQ examination, it will allow budding designers to begin apprenticing with other established professionals. Design professionals seeking to increase their awareness of environmental issues would benefit from a sustainable design certificate, an option offered online by numerous institutions. Within this program, topics in sustainable real estate, environmentally friendly building materials, energy-efficiency and resource conservation are covered. This course would also be applicable to those with an interest in historic preservation topics. The online BFA in interior design offered by RMCAD is focused on equipping students to understand and successfully translate the diversity of both their clients and the spaces they work with. By focusing on the aesthetic, technical and business skills necessary in the interior design industry, graduates are well prepared to be successful and integral members of any design firm. The degree is composed of 125 hours and can be completed in four years of full-time online study. Core curriculum highlights include manual drafting and computer aided design (CAD); space planning; interior materials and systems; environmental and human behavior; lighting design; construction documents and contracts and business practices. 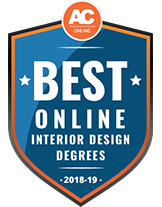 As one of the top schools in the world for art programs, the online master’s in interior design is a rigorous and respected degree and graduates are recognized for providing innovative and creative design solutions. The program requires 45 credit hours of study and equips students to understand the collaborative nature of humans and their environments. By taking this view, students learn how to engage aesthetic theory, culture, materiality and function to create innovative spaces for any client. Some of the core classes include interior design theory and criticism; emerging interior materials; human response to the built environment and contemporary issues in interior design. AIU is praised as an exemplary program for its commitment to providing both a holistic and nuanced understanding of topics within interior design. By recognizing and understanding the goals of students within the program, the university is able to offer personalized plans of study to meet the needs of each candidate. The 72 credit hour program includes a significant focus on research and prepares graduates to go on to leadership positions in design firms, executive positions in government and education consultation and university level teaching roles. As online learning continues to become a significant component of educational offerings, many institutions are placing special focus on the faculty delivering these courses. Whether insuring online faculty are the same staff teaching on campus classes or requiring specialized professional development in how to deliver online courses, most universities hold online professors to the same standards as traditional faculty. That being said, students should still research the department to ensure their interests and areas of expertise align with their own. For instance, if students are interested in sustainable design, they should make sure there is at least one faculty member teaching in this specialization. The governing body for interior design degree programs is the Council for Interior Design Accreditation (CIDA). Currently there are two online interior design programs that are CIDA accredited. These are offered through the Academy of Art University (BFA and MFA in Interior Architecture and Design) and The Art Institute of Pittsburgh (Bachelor of Science in Interior Design). Internships play a role in most interior design programs and provide vital real-life training for students before entering the job market. Additionally, these opportunities will give graduates a few contacts in the industry to reach out to once leaving school. Online programs work with students to identify a suitable internship program in their state; these placements are typically between 150-225 hours and are completed over the course of a semester. Students should also be aware that professional organizations, including the Foundation for Interior Design Education Research and the American Society of Interior Designers, are very powerful within this industry. After completing their degree and meeting NCIDQ requirements, students should try to become members of these professional groups to assist in their job search. Many universities now boast the ability to provide the same services and resources to their online students as they do to traditional on campus counterparts. Within the interior design program, this could include online access to design project collections, online libraries, mentorship with a graduate working in the field or career services. The skills needed to be an interior designer include an artistic and technical flair, thoughtful interpersonal communications and good business acumen. It is no surprise then that qualified interior designers find themselves in myriad positions, some of which fall outside the traditional career scope. Aside from the well-known roles within the industry, other arenas where graduates with these skill sets thrive include set design, industrial design, home staging, graphic design, consulting, and architecture. Though some of these roles may require additional education (architecture, in particular), the skills gained through undertaking an online degree in interior design will serve professionals well should they choose one of these non-traditional paths.